Inkscape - How to get information from measures I am making? I am doing some analysis of some images, so I need measure the distance and the size of the lines and write that down in a Google Sheet. Like in the image below, I use the measure tool to get the distances but I have to type every number by hand. Is there a way to copy all this information at once? My research shows that the most likely answer is a work-around. The information I've found indicates that you can't "easily" collect dimensions, but that doesn't mean it's a complete loss. From this SE comes a similar question and answer that might work for your purposes. You'll have to create individual paths between the horizontal lines, or select the nodes for your measuring line and break all of the nodes. This will allow you to select each one in turn, to follow the instructions from the above link. Effectively, you select each path segment, then use Extensions, Visualize Path, Measure Path and ensure that the units are as you require. When you apply the settings, text with the measurement will appear as part of the drawing. You could conceivably use programming to read the text in the resulting SVG file, but that's beyond my abilities. I've seen references in other questions regarding extracting specific data from the file and I would expect someone else with greater grey matter capacity would be able to do so. Please note that this is not a particularly fast process, but you can leave the dialog box open while selecting each segment in turn and pressing apply. This speeds up the otherwise tedious action of going through the menu selections to get to the apply button each time. Double check that you've checked Length in the option, otherwise uncertain results will appear! Not the answer you're looking for? Browse other questions tagged inkscape path shapes or ask your own question. How to edit Inkscape measure text for small measures? How to prevent constrained text from disappearing after too many characters? 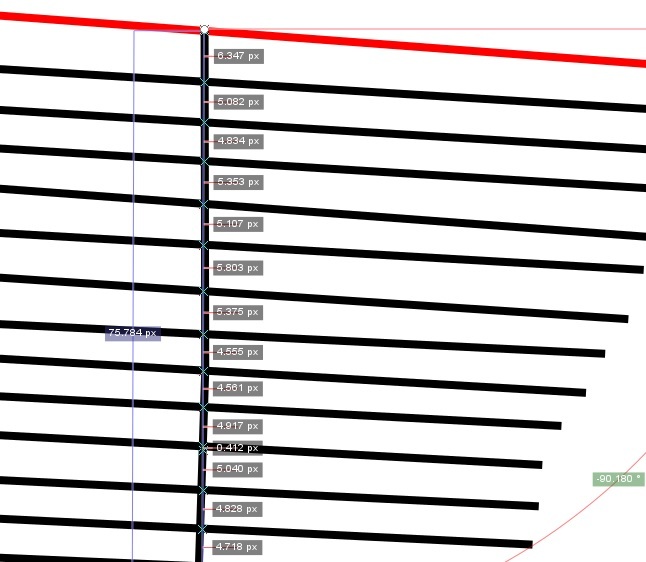 How can I control the dots (and gaps) on a stroke in Illustrator?